Each scene 26.5 x 36.5 cm., each sheet 36.5 x 51.5 cm. The present images of the production of porcelain, tea, silk and rice are based on scenes known as the Gengzhi tu, 'Illustrations of Ploughing and Weaving', depicting all aspects of Chinese rice-production and silk cultivation. The work was commissioned by Emperor Kangxi and was published in 1696, comprising woodblock prints by the court painter Jiao Bingzhen and accompanied by Kangxi's own poetry. The emperors Yongzheng and Qianlong also published such works, while Qianlong added the theme of the porcelain production to the two existing series. During the Qing dynasty, many versions of the production processes were published. Not only were they much sought after on the Chinese market, but they were also produced for Western buyers, to whose taste they were adapted: the series were mainly published in watercolours, instead of the traditional Chinese pen and ink, and the Chinese calligraphy is abandoned. 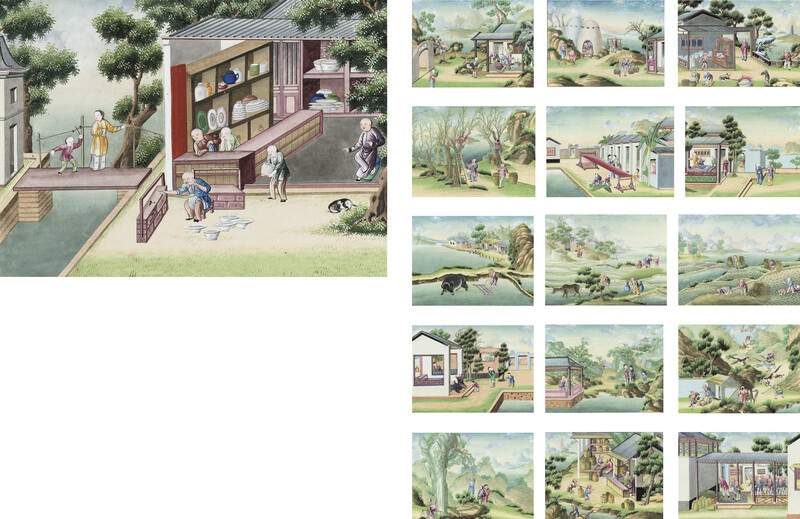 The watercolours in the present lot loosely follow the subjects of the Gengzhi tu, yet the colourful and lively rendering of the subject, also including many scenes of trade, are especially appealing to the Western eye.